Are you looking for a fun movement challenge? Do you wish you had some exercise buddies for support? Do you want to try fitness events without the pressure of being in an organized race? Or are you just looking for an event with the epic level of coolness required to inspire you? Well wait no longer, because the Fit Fatties Forum is excited to announce the next Fit Fatties Virtual Challenge! This is our third challenge and we’ve tweaked the program to make it even bigger and even better! 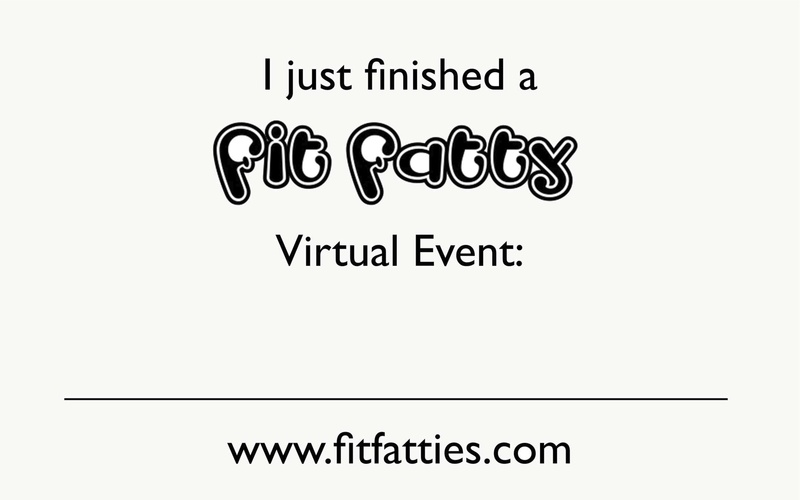 The Fit Fatty Virtual Events (FFVE) allow you to set goals and celebrate achievements in a way that works just for you. Train for and complete virtual events any way you like – join an organized race, or complete the events alone or with a group of friends in your neighborhood or at the gym–whatever works for you! And these aren’t just any events. Oh no. The FFVE feature both traditional and way-out-of-the-box events! You can even create your own event and have it added to the list. Below you’ll find a list of events. You can choose to complete a decathlon or double decathlon for even more prizes and bragging rights. Get in on the action – register here! 2. Post your photo to the Fit Fatties Facebook Page (www.facebook.com/groups/fitfatties) starting the post with “Virtual Event Complete” (That will solve the problem of people’s posts getting buried before we see them). We’ll will get your photo up on this site and the forum and update your position on the leader board! By registering, you are acknowledging your awareness and assumption of all risks associated with your participation. You are certifying that you are medically and physically fit to compete safely in the events that you choose, and you are agreeing to hold harmless the Fit Fatties Forum, Ragen Chastain and Jeanette DePatie for any outcomes of your participation. Do you have to be fat to do this? Nope! We welcome people of all sizes, our use of the word fat is about making a specific place for fat people in the fitness discussion, not about excluding people who don’t identify as fat. Why are you charging for this? Keeping the forum going costs money and takes time. We like the idea of a relationship where we support our members and they support the forum and get cool experiences and prizes in return. The funds from this go right back into the forum. Are people with disabilities welcome? Absolutely! We invite everyone to modify any existing events and to suggest your own events that work for you. Liability Waiver: By registering, you are acknowledging your awareness and assumption of all risks associated with your participation. You are certifying that you are medically and physically fit to compete safely in the events that you choose, and you are agreeing to hold harmless the Fit Fatties Forum, Ragen Chastain and Jeanette DePatie for any outcomes of your participation. Yoga events? Did I mention this is awesome? What is the end date for completing events? I can walk a mile now but would need months to work up to a 5K walk. You have the entire year to complete the events. The registration fees change throughout the year so you can register now for the Super Early Bird event and take as much time as you need this year to complete the events. But for 2015 we only have until April 30, correct? Correct. We are actually going to do 3 Virtual Event challenges this year based on feedback from people last year. The first one goes from now until 4/30, the second one from May-August, the final one from September-December, each one will have its own set of prizes. Many of the links are broken – the sign (which was gone when I refreshed), the fb page and the forum link. That said, I am super excited about this! Love some extra challenge in my workouts! Thanks for letting me know. I’m so sorry you’re having trouble. I just tested all the links and the sign and they worked for me so I’m not sure what’s going on, I submitted a support request about it. The links are written out so if it’s still not working you could copy and paste (though I’m really sorry they’re not working) and within 24 hours of signing up you’ll get a welcome e-mail with a copy of the sign. I’m glad you’re excited about the decathlon! I really like how the decathlon is going to have to be a mix of things I already do regularly and new challenges as well! Do the distance events (5k, 10k, etc.) need to be organized events? Nope, you can do all of the events in any way that you choose – you can join an organized race, or do it in your neighborhood or at the gym,alone or with friends, whatever works for you. 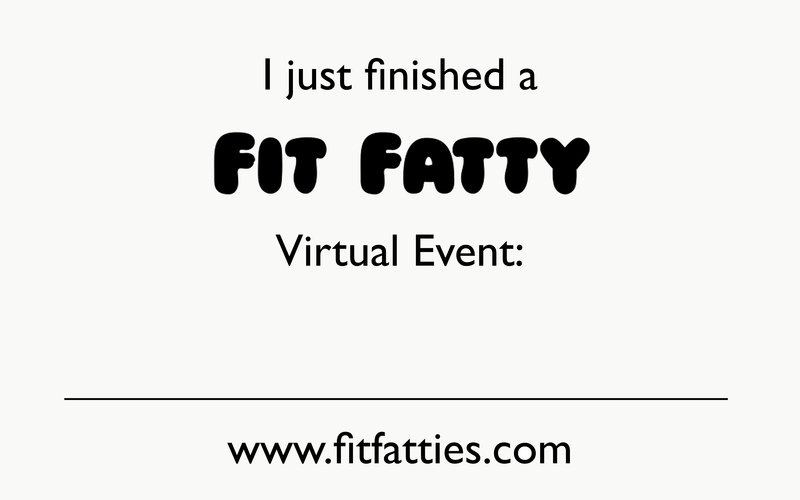 All registered for the double decathlon, fit fatty virtual event signs printed- 5k in 8 hours!! I can’t wait to get this going! Have fun, can’t wait to see the picture!!!!! signed up for 2 decathlons. 1 for me and 1 for my daughter. we are going to have some fun! Awesome! If you could get me your daughters name (you can e-mail it to me at ragen at danceswithfat dot org) for our records, that would be awesome! Is work with silk veils considered a flow event? We’re gonna have two veil workshops in February. And water class – do you think completion would be one class or a month of classes? I really like this idea of putting my intentions out there! The class counts as one event. If you want to do that then signing up for 10 of them at $30 would work great and you’ll get prizes and bragging rights for that 🙂 If you want to count the class as one of your decathlon events and do 9 other events as well then you could sign up for the decathlon for $25. Yes, silk scarves absolutely count as a flow toy! I can’t wait to sign up for the decathlon at the end of the month! I noticed we have all year, but do we get our super awesome tote bags of goodies as soon as we finish the decathlon? We are going to order prizes quarterly starting in March. So if you plan to finish between now and June, you’ll want to make sure that you’re registered before March 1st. Let me know if that doesn’t make sense.